How Hollywood Gets Fed: A Lesson In Craft Service Gone are the days when actors brought their own lunches to the set in brown paper bags. It's a full-time job feeding the hundreds — sometimes thousands — of men and women working each day on major films. Susan Stamberg spends a day with craft service — the crew responsible for the snacks that keep moviemakers going during long days of filming. 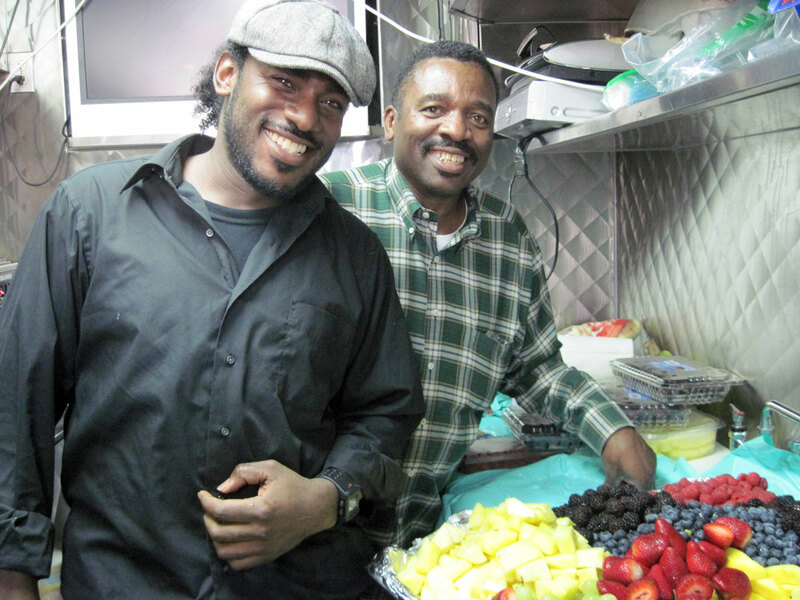 Charlie Scott II (in plaid) has worked in craft service for 15 years; his son, Charlie Scott III, has worked alongside him for the past nine. Together, they keep everyone on set — from electricians to extras to actors — fed, hydrated and happy. When Napoleon said that "an army travels on its stomach," he was talking about military troops, but he might as well have been talking about Hollywood. Moviemakers, with their long hours and tight schedules, count on calories to keep them going — and on any set, it's up to craft service to tend to their care and feeding. 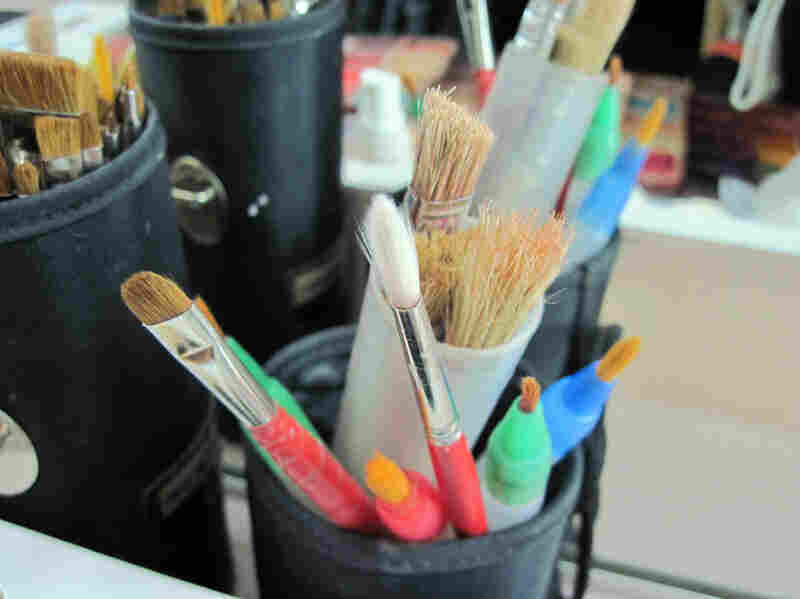 In literal terms, craft service assists not so much the stars, but the crew: "craft" workers such as grips, gaffers, property masters, costumers, electricians, hair and make-up artists. These days, the job is mainly known for providing workers and actors with lavish snacks — all day long. "The actor [who] makes $20 million a film can have fresh lobster flown in every day. That's not a problem," says Craig Conover, who used to be in craft service and now works for the local union. "But it's the guys that are hauling around the lights and the cameras that need that sustenance so they can do their job day after day after day — 14-, 16-hour days — in some reasonable amount of comfort." In the old days, craft service didn't deal with food at all, because there was no free food service on the studio sets. Actors simply brought their own food in brown bags, and there was a break for lunch. Universal Studios started a tradition of rolling a coffee and doughnut cart to each stage — everyone would put a nickel in the cup in the morning. But then hours on set really began to stretch out. "Now you get into issues of people being tired, being hungry," Conover says. "Well, who's gonna order the pizza? We'll have the craft service guy do it." Craft service was already doing odd jobs: digging a hole to place a camera at ground level, laying out protective material on sets — and cleanups, too. After a movie car crash, for instance, craft service would sweep up the broken glass. Conover tells an old saw about the movie elephant that "divests" itself of a meal on location: Someone nearby runs over to clean it up, "and the craft service guy stops him and says, 'No, no no! It may look like crap to you, but it's my bread and butter.' "
Eating has become an important production on set. The main hot meals are catered, but all the snacking between meals is the domain of craft service. 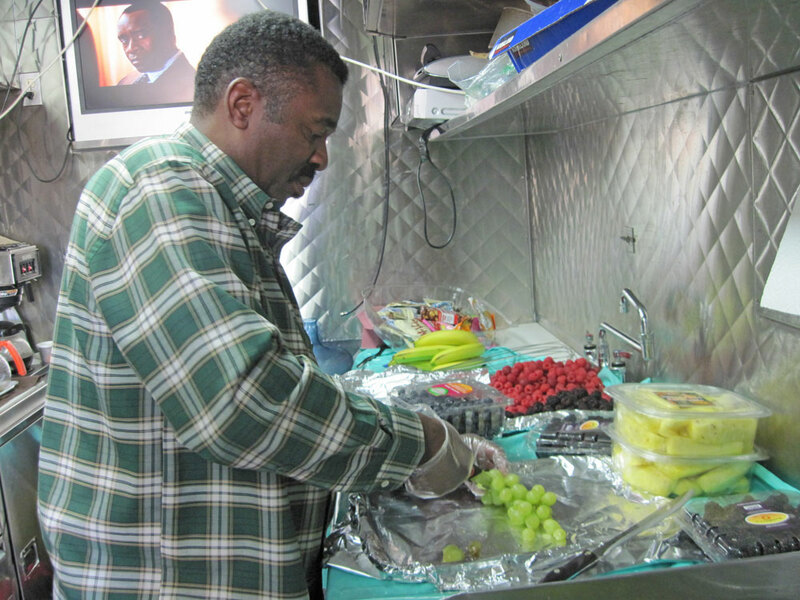 Scott readies a fruit platter in the craft service truck, a narrow trailer where all of the "in between" snacks are prepared. Hot meals — breakfast, lunch and supper — are handled by a caterer. Charlie Scott has been feeding people on movie sets for 15 years. His latest job is with the film Burlesque, starring Christina Aguilera, Stanley Tucci and Cher. Scott works long hours; no matter how late he stays on the set, he gets a morning wake-up call around 4:30 a.m.
Today, he needs to keep about 250 people on the set fed and hydrated, so he'll make numerous trips throughout the day to various stores and supermarkets for fresh bagels, doughnuts and snacks. "I've been doing this so long there's no need to keep a list," Scott says. "Sometimes I go to the store for 130 items — never a list." In the supermarket, Scott grabs lettuce, handfuls of radishes, and celery for a salad and veggie platters. He piles bananas, oranges, mangoes, pineapples and strawberries in his cart. "They eat all day," Scott says. There's only half an hour allotted for lunch. There won't be any leftovers, either. "By the end of the day, it'll all be gone," he says. 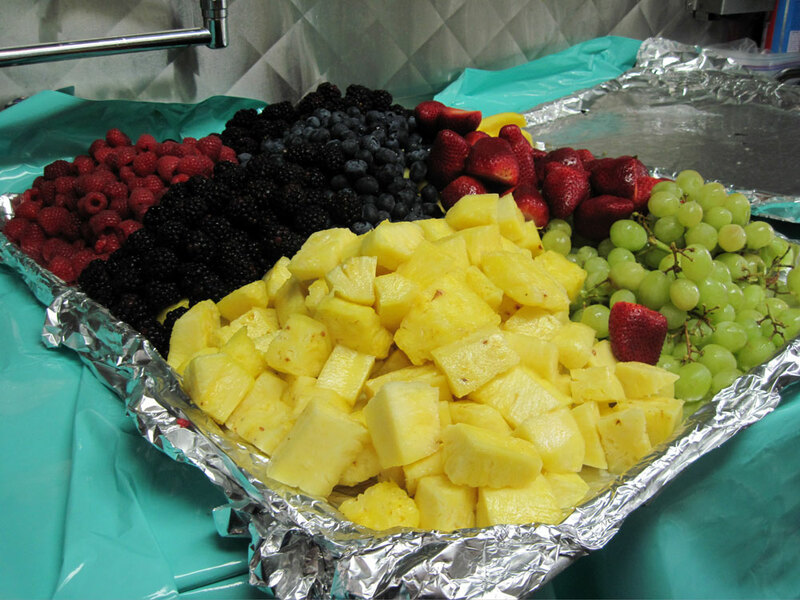 A fruit platter prepared in the craft service trailer is ready to be brought to the set. "More and more people on movie sets are into health," Scott says — though he still keeps plenty of chips and candy on hand. His morning shopping cart runneth over — $260.67 worth of "in between" snacks. By day's end, he'll have spent $1,000 to feed 250 people snacks. This 250-person movie set is nothing compared to the time Scott worked on The Longest Yard — the 2005 football movie with Adam Sandler. There were 5,000 extras in the stands for 30 days in the summer months, Scott recalls. And that wasn't even including the crew. "I had a crew just for water," Scott says. "I had another crew just for cleanup. Another crew just for food." The film Burlesque is being shot indoors on the Sony Pictures Studio lot in Culver City, Calif. Scott prepares the food, cutting up the fruit and vegetables, in a trailer a few hundred yards from the studio stage door. His son, Charlie Scott III, is in the trailer with him, helping out. The two Charlies have been working together for nine years. "A lot of times when parents are in this industry, they really don't get to see their children," Scott (the son) says. "In the morning, you know, Dad's gonna be there. Like death and taxes." Charlie Scott III carries a large fruit platter from the trailer into Stage 23 and places it on a 12-foot-long table just off the set. The table is full with the food his father bought this morning. People wander by, look and graze. At various times throughout the day, crowds of people will swarm the table. Heart and mind and soul and spirit are all taken care of in that truck. But there's little time to waste, Charlie and Charlie (and another helper) have to prep for the next round of snacks. Glenn Gainor of Sony's Screen Gems says a craft service veteran like Charlie Scott is on top of everything — he's good for the stomach and the psyche. "He's definitely the first person on the set." Gainor says. "He's got to make sure, when everybody struggles their way at 6 o'clock in the morning, that the coffee's on and the coffee's hot. Charlie is always smiling and happy to see you. ... Heart and mind and soul and spirit are all taken care of in that truck." Keep the food coming. Keep the place clean. Mr. Craft Service Charles Scott keeps this long day going ... and starts all over again the next day, and the next, and the next. A spaceship lands. Humans become avatars. A man in a cape can fly. Special effects have made movies magical for decades. Big-dollar or ultralow-budget, the goal is the same: to frighten, fool or thrill the audience. 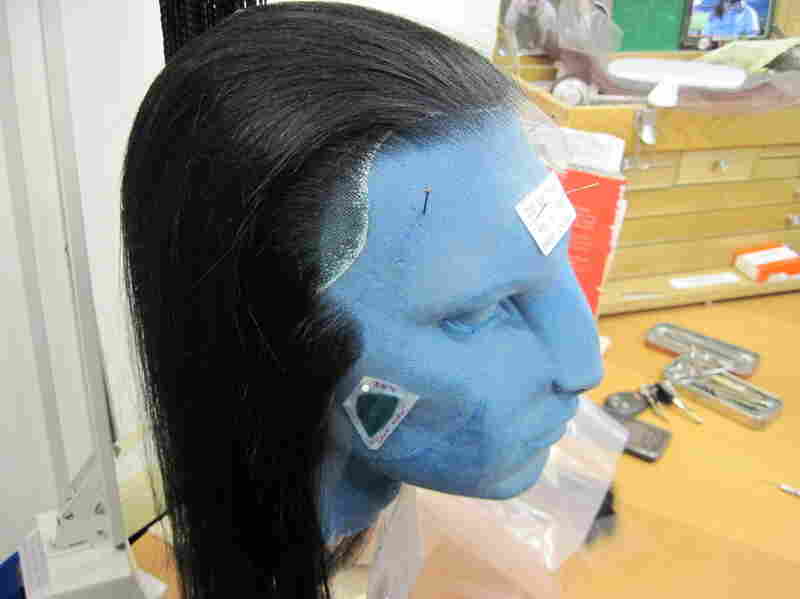 Legacy Effects, a special effects studio in California, designed the hairstyles for the characters in Avatar — the hairstyles were all fashioned out of human hair. 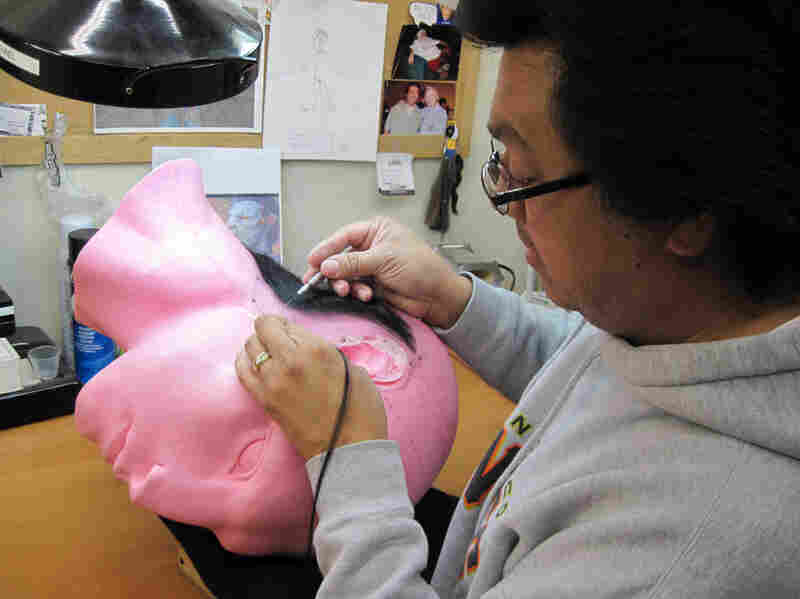 Michael Ornelaz, a wig maker at Legacy, fastens the hair to a superfine lace net — one strand at a time. 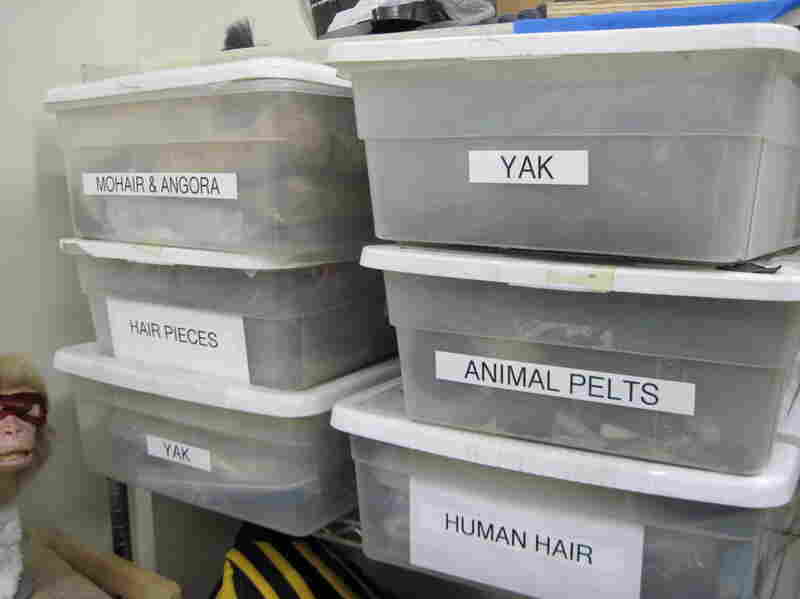 Boxes of hair for Legacy's stylists. Yak hair is commonly used for gorillas and lions, because it is thick and spirally. 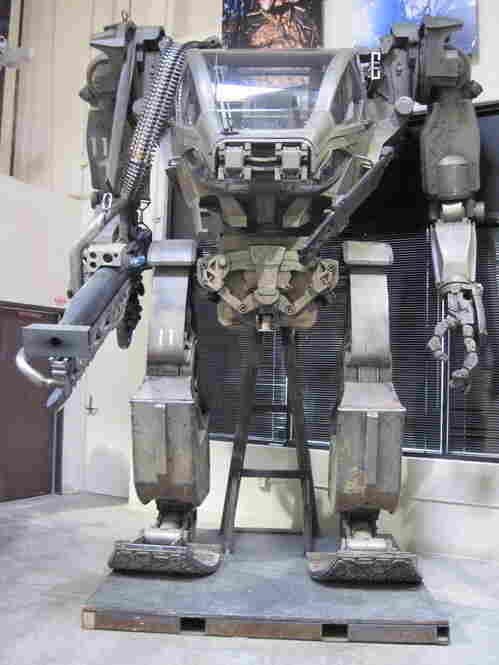 The Armored Mobile Platform (AMP) tank suit from Avatar stands 13.5 feet tall. It was constructed from 200 separate pieces, all hand-detailed, to give it a metal textured look. 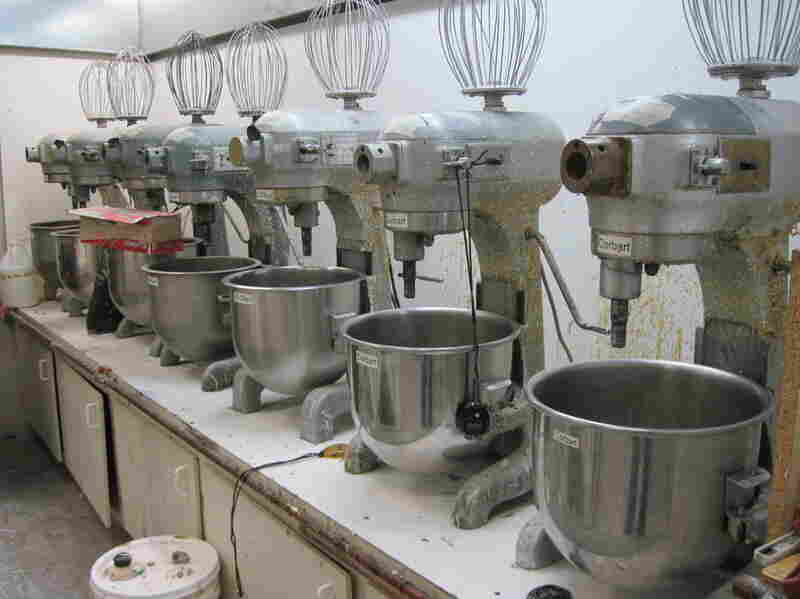 Seven mixers sit at the ready in a climate-controlled room. They are used for mixing foam — the first stage for making glue-on prosthetic devices. 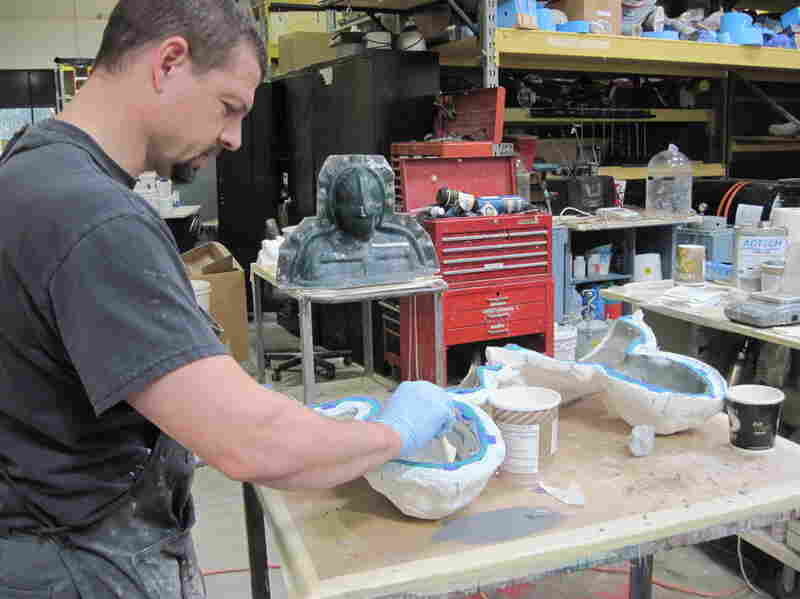 The mixed foam is then set in molds, baked and peeled out. 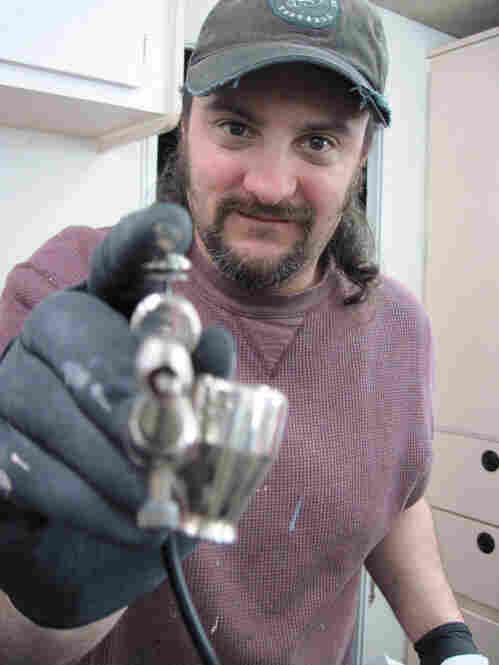 Here, a technician constructs facial parts for the upcoming film Thor. 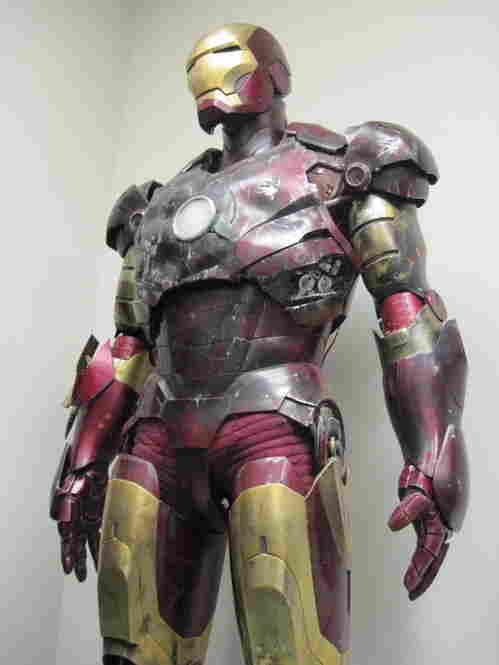 The suit from Iron Man has taken a little bit of a beating. 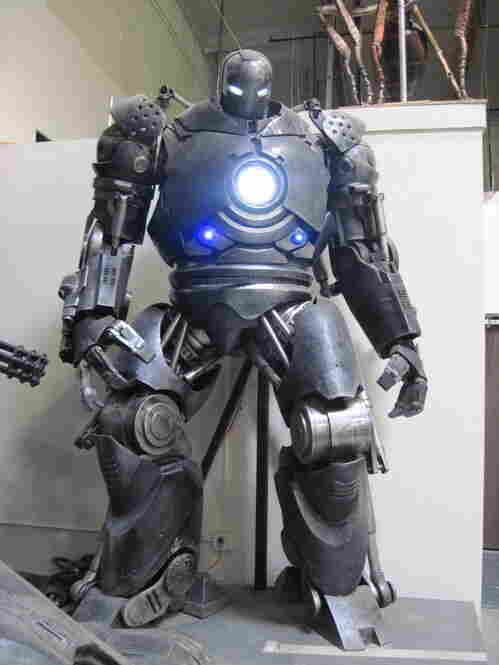 The Iron Monger's armor from Iron Man stands menacingly in the Legacy warehouse. 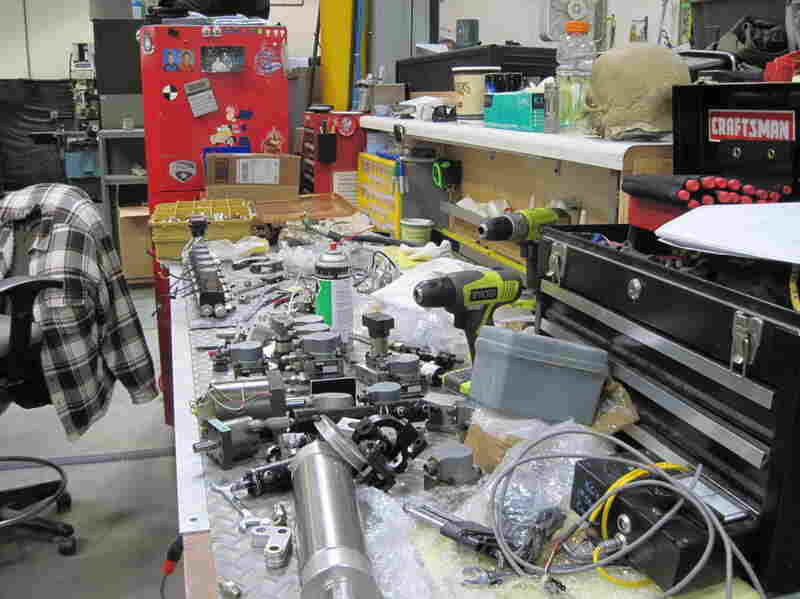 A work space in the Legacy Effects warehouse, where animatronics (mechanized moving parts) are created. 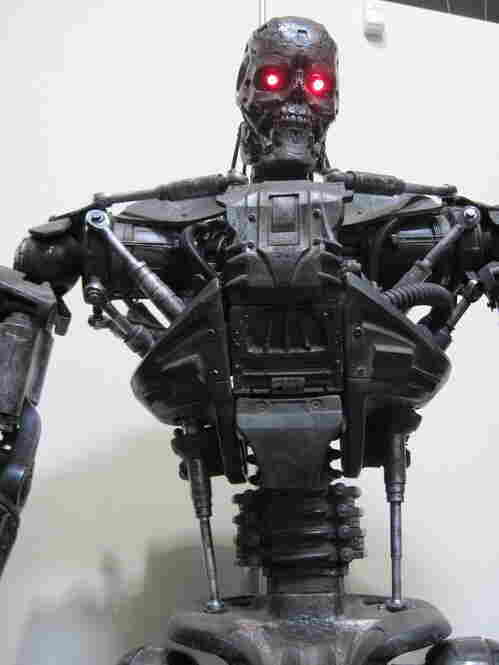 The T-600 from Terminator Salvation. 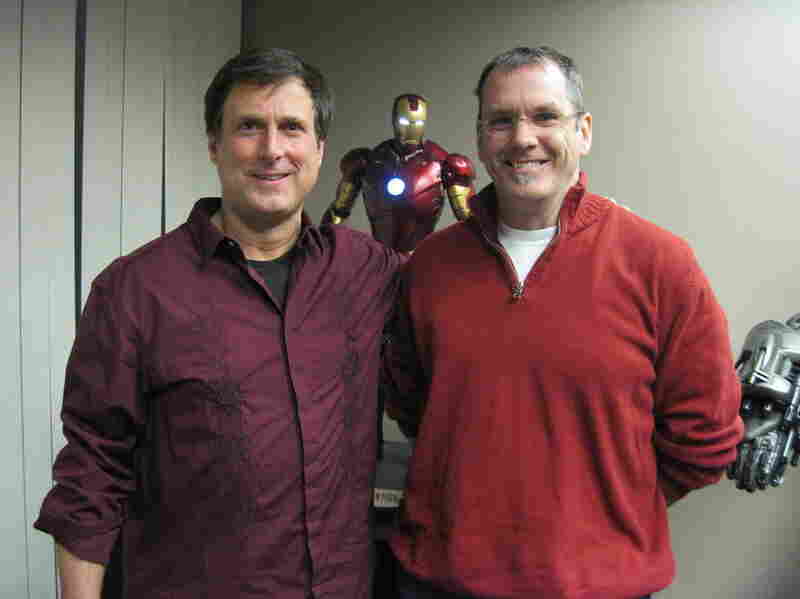 John Rosengrant (left) and Alan Scott are two owners of Legacy Effects. Both worked with the late Stan Winston, the special effects guru behind Terminator, Jurassic Park and Aliens. After Winston died in 2008, Rosengrant and Scott started Legacy, and named it in their mentor's honor. For a huge movie like Avatar, various special effects companies spent years on the project. One of them, Legacy Effects, had about 120 people working on the look of the inhabitants of the alien moon, Pandora. But special effects happen on a smaller scale as well. In a cramped trailer in Van Nuys, Calif., two guys mix up fake blood for a slasher scene in C.L.A.S.S. (that stands for Criminal Law and Student Slayings). It's so low budget — $1 million — the filmmakers are shooting in producer Sheldon Robins' aunt's house for the film's final scene. Robins put much of the little money he had toward special effects makeup. "The most important part was making sure my kills didn't look cheesy," he says. Jerry Constantine will commit the makeup murders. Constantine did special effects makeup work on The Curious Case of Benjamin Button, Watchmen and Van Helsing. Usually, for bloody scenes, Constantine attaches plastic tubing to the actor's back, and with a syringe, fires fake blood through the tubing during the live scene. But not on this budget. 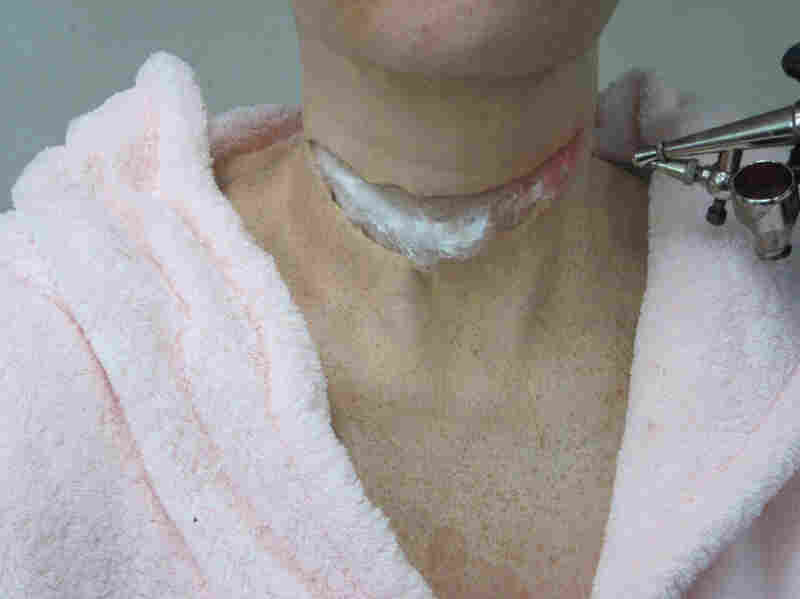 A thin piece of latex foam with a slit cut into it is placed on the actress' neck, pulled tight and glued down. 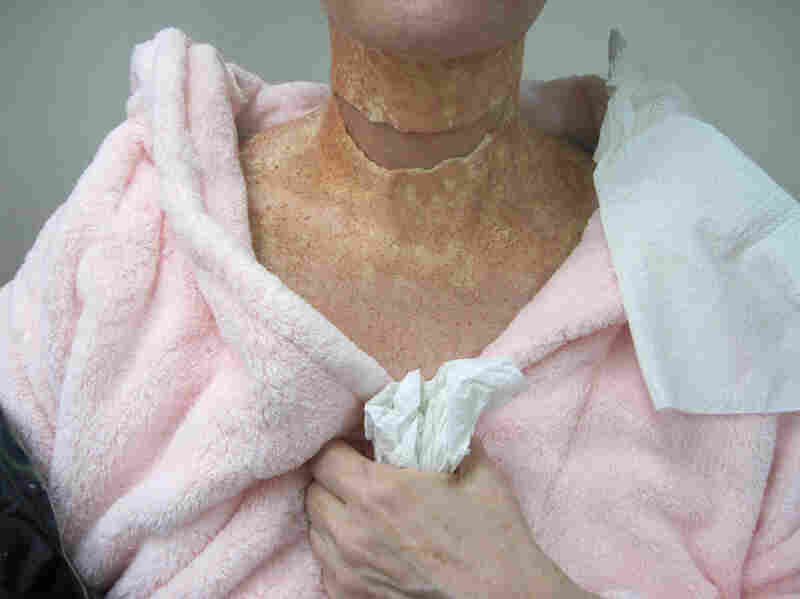 The makeup artists dab various tones of flesh-colored makeup and spray pale brown dots onto the actress' new "neck" to create a natural look. 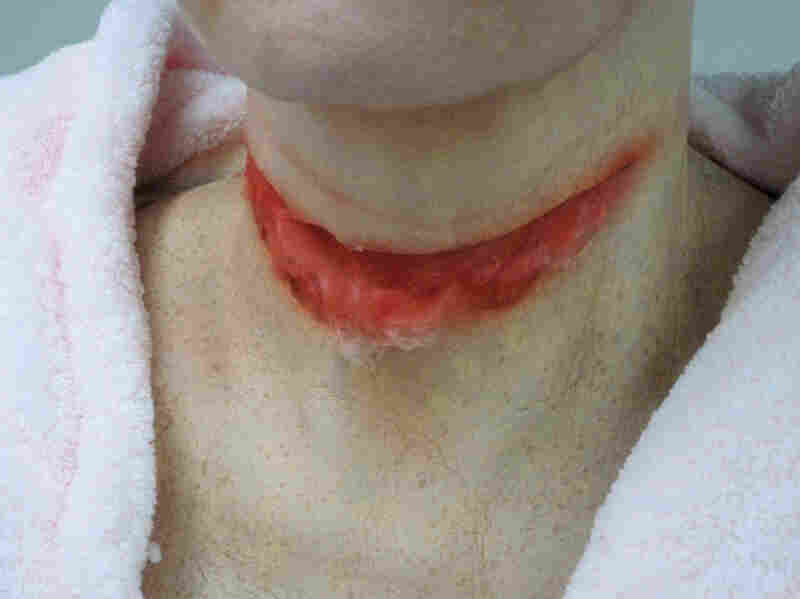 Cotton is placed into the slit of the latex, so that makeup artist Jerry Constantine can prepare the neck for what he calls "the meat" — the innards of the wound. Constantine sprays red coloring — "the blood" — onto the "wound." Don't worry kids, it's all fake. With a tiny spatula, Constantine applies what looks like raspberry jelly on top of the cotton. Adding water makes the wound look drippy. 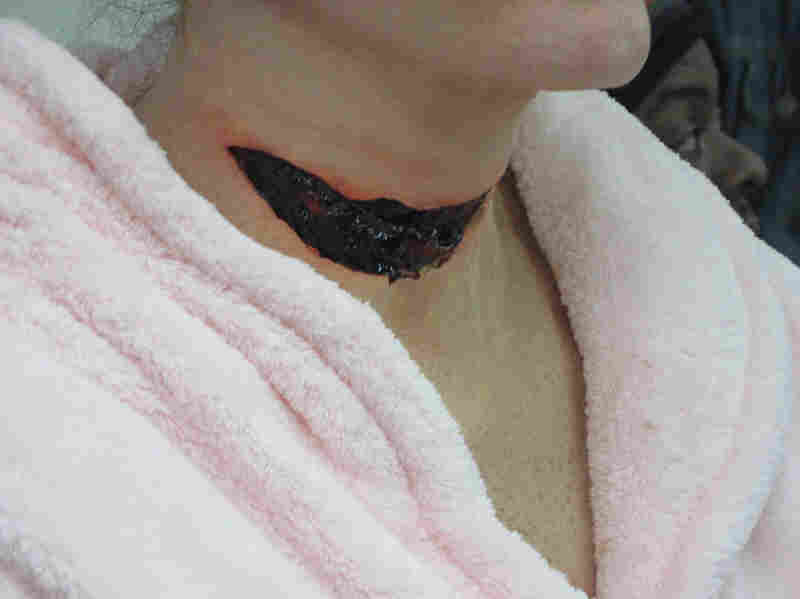 For the final effect (which, sorry, we can't show you) "blood" will be splattered all over the actress' neck. 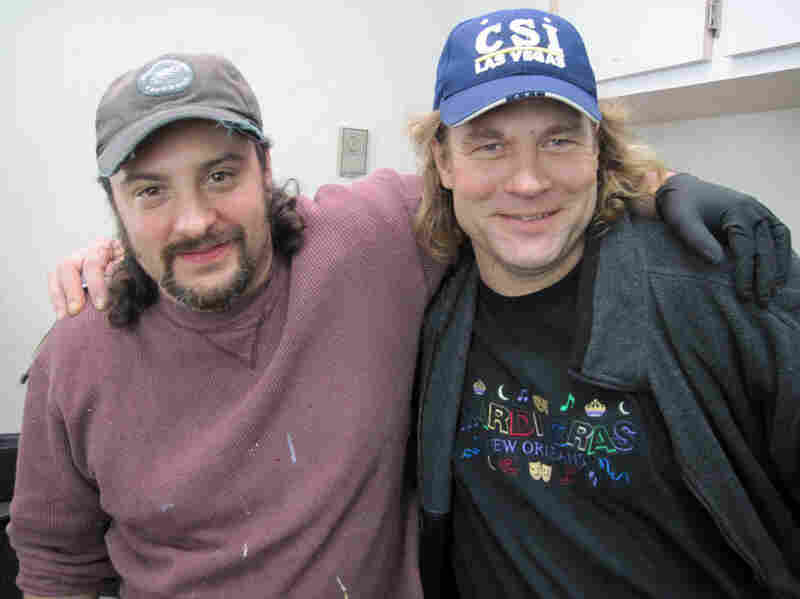 Jerry Constantine is the special effects supervisor for C.L.A.S.S. (Criminal Law and Student Slayings), a small-budget murder mystery film. He has also worked on The Curious Case of Benjamin Button, Watchmen and Van Helsing. Mike Measimer has worked with Constantine on many films over the past 11 years. It takes an extensive palette to commit makeup murders. "They don't have time for the two-hour makeup for me to pull the actor, glue the appliance on, and then spurt the blood," Constantine explains. "So we fake it out." Constantine powders the line where the foam meets skin. With a sponge dipped in makeup, he dabs various pinks onto the fake flesh, then sprays on some pale brown freckles. It looks just like the woman's natural neck, but with a big empty slit in the middle. And now, the slashing begins. Before it gets too gory, we're going to cut away (as it were) to some of the special effects folks who worked on Avatar. 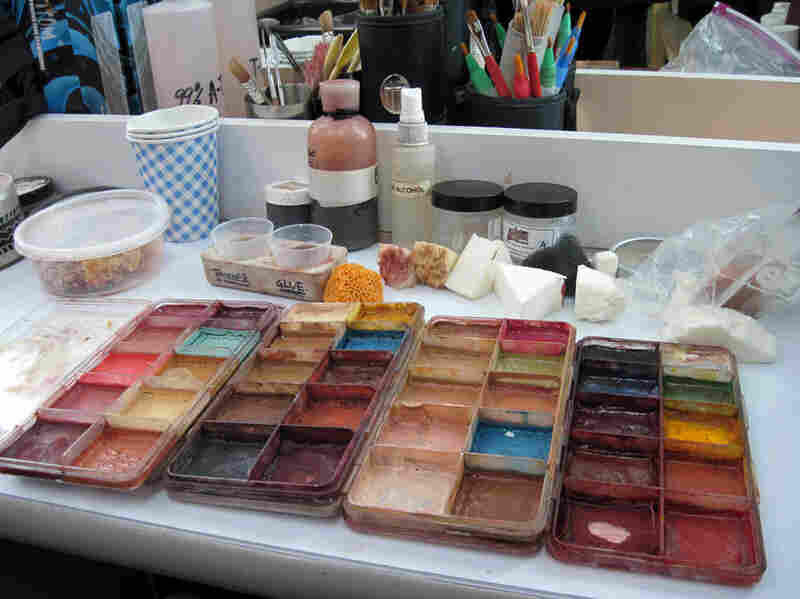 Legacy Effects, the special effects company for Avatar, is the offspring of the Stan Winston Studio. Winston worked with Avatar director James Cameron on his Terminator films, creating the menacing bots from the future. (Winston also did Aliens and the groundbreaking dinosaurs in Jurassic Park.) Winston's studio started working with Cameron on Avatar in 2006, but Winston died of cancer in 2008. "It's like Apache helicopter meets power loader from Alien," says John Rosengrant of Legacy Effects, describing the Armored Mobile Platform (AMP) designed for Avatar. John Rosengrant, Winston's protege of 25 years, and a few others at the studio started Legacy Effects, a name in honor of their friend and mentor. 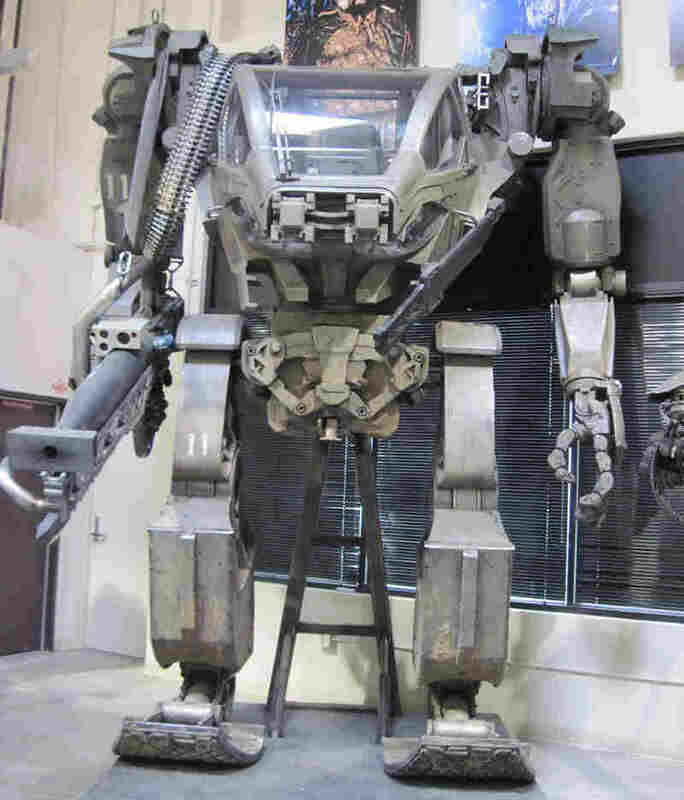 They carried on the work in Avatar, creating the specialty props such as the enormous Armored Mobile Platform (AMP) suit, which looks like a tank on legs. The AMP is on display in Legacy Effects' warehouse, where all their movie, TV and commercial props and makeup effects are made. The AMP stands 13.5 feet high, and it's made of 200 distinct pieces — hand-detailed to suggest a metal texture. "It's like Apache helicopter meets power loader from Alien," says Rosengrant, who worked on all three Terminator movies. Standing nearby the AMP suit in the warehouse is a rogues' gallery of specialty props: the Avatar Scorpion cockpit; the T-600 robot and two-gun turret tank from Termination Salvation; and the Iron Monger from Iron Man. Rosengrant and his team also created the prosthetic legs actor Sam Worthington wore in Avatar. They found a Sam-sized young man — whose paralysis didn't stop him from playing basketball — and made a cast of his legs. "We finished them off in silicon and punched individual hairs into them. [The prosthetic legs] would get strapped onto Sam, and his legs would go down into holes in the wheelchair," explains Rosengrant. "I think it was important to make sure that this was convincing, because it really sells the idea of Jake in his freedom as an avatar versus how he was trapped on Earth." Rosengrant's team also conceived the look of Pandora's Na'avi people — with their enormous eyes. The team selected snow leopard eyes as inspiration and played with the color, turning them more golden and less green. "You always draw from nature," says Rosengrant, "because you're trying to make the unbelievable believable." Tools Of The Trade: It takes an extensive color palette for makeup artists Jerry Constantine and Mike Measimer to create their on-screen illusions. 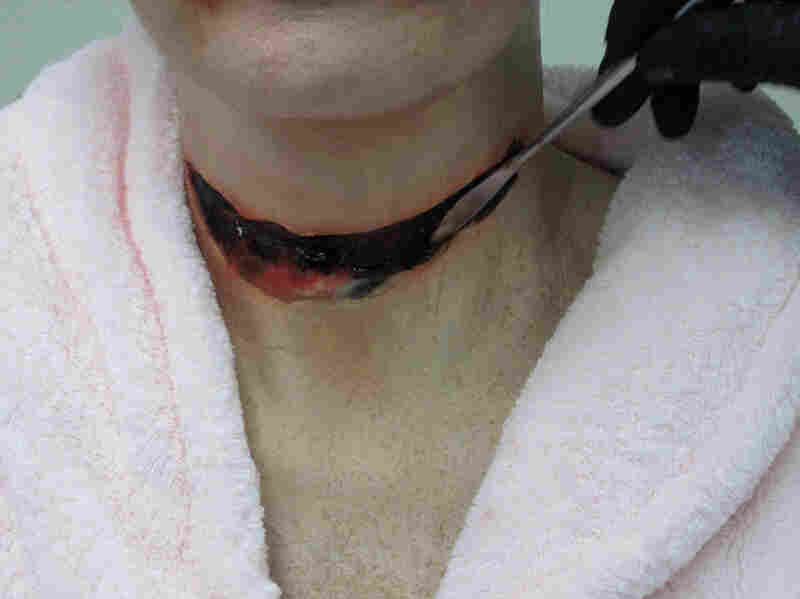 Making the unbelievable believable is a tall order on a small budget, but special effects makeup artists Jerry Constantine and Mike Measimer are still working on wreaking murderous mayhem on an actress' neck in C.L.A.S.S. So far, they've made the prosthetic to look completely natural with the actress' skin. Constantine adds cotton to the horizontal slit area. He's creating what he delicately calls the "meat." The cotton will give dimension to the wound area after red coloring is applied to look like blood. Then, with a tiny spatula, Constantine spreads what looks like raspberry jelly on top. And ick — it suddenly looks like thickened blood. "This where it starts to look like what it is," says Constantine. And it does. It looks so real, you want to turn away. With all the advanced special effects on movies these days, it's hard to believe that Constantine and Measimer are still doing it the old-fashioned way. But even at a big studio like Legacy Effects, "slashing" is alive and well. Alan Scott, one of the co-owners of Legacy and a Stan Winston protege, stands by the old methods. "The technologies that have been used in special makeup effects that worked for nearly 100 years still work," Scott says. He says digital blood is not as messy, but you don't have actors reacting to something visually horrible, either. "If you just have a tennis ball that you're playing to, it's hard to understand that there's a 30-foot creature trying to eat you," Scott says. Scott and Rosengrant were inspired by all the old, great classic horror films — Frankenstein, The Mummy — and actors like Boris Karloff and Lon Chaney. In fact, Scott says, he'd love to do a full-on zombie movie. "That's part of our roots," he says. "We love horror. My wife doesn't understand it, but that's my whole Netflix library."